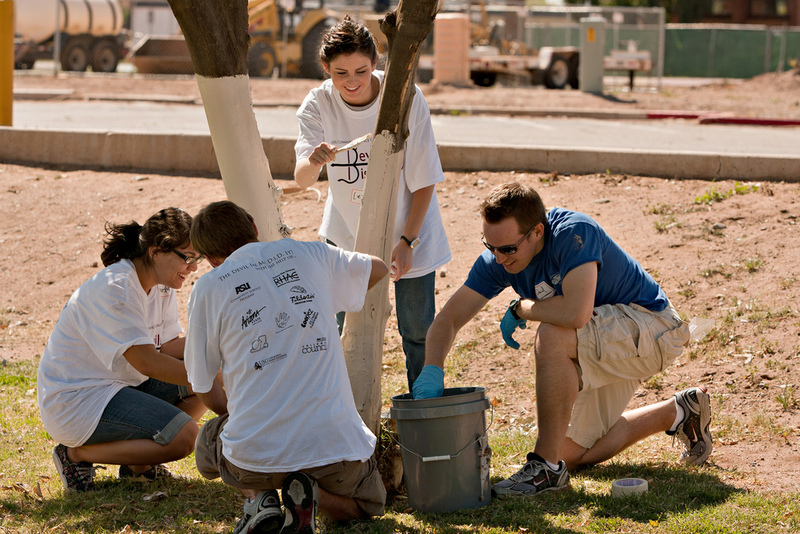 For the fifth consecutive year, the Corporation for National and Community Service has named Arizona State University to the President’s Higher Education Community Service Honor Roll. ASU is the only public university in the state of Arizona to receive the Honor Roll classification. More than 19,500 students provided over 778,000 hours of community service during the last academic year through mutually beneficial partnerships with local, national and international sites. ASU offers over 325 courses that integrate community service with academic content through academic service learning, and it also employs over 50 staff members who coordinate community service and engagement opportunities in units across the university. "Service and higher education go hand in hand," states Wendy Spencer, CEO of the Corporation for National and Community Service (CNCS). "These schools are inspiring young leaders to roll up their sleeves and work alongside community members to solve problems. By recognizing the institutions who are leading the way to achieve meaningful, measurable results for the communities they serve, we also highlight the vital role all colleges and universities play in addressing community challenges and placing more students on a lifelong path of civic engagement." CNCS, the federal agency for volunteering and service, has administered the award since 2006 in collaboration with the U.S. Department of Education and the U.S. Department of Housing and Urban Development, as well as the American Council on Education, Campus Compact and the Interfaith Youth Core. For the full list of 2014 awardees, visit nationalservice.gov/HonorRoll. ASU's innovative course UNI 220: Academic Refresher has gained national attention for its approach - and successes - in helping struggling students regain a positive academic trajectory. Looking to improve your academic performance? Begin by looking inward. “Rather than focusing on narrow skills like note-taking and preparing for exams, our emphasis is on building emotional intelligence, greater self-awareness and a mindset that supports resilience,” says Gina Beyer, director of Academic Success Programs in the College of Letters and Sciences and UNI 220 course manager. In spring 2012, ASU’s Faculty Senate voted to make UNI 220 a required course for all undergraduate students placed on academic probation, but enrollment is open to anyone. Data collected from the University Office of Institutional Analysis indicates that probationary students who successfully completed the course in fall 2012 increased their end-of-semester GPA, on average, by .85, and their cumulative GPA by .43. In terms of retention, 75 percent were still enrolled as of fall 2013 – a rate that is very high compared with probationary students nationally. 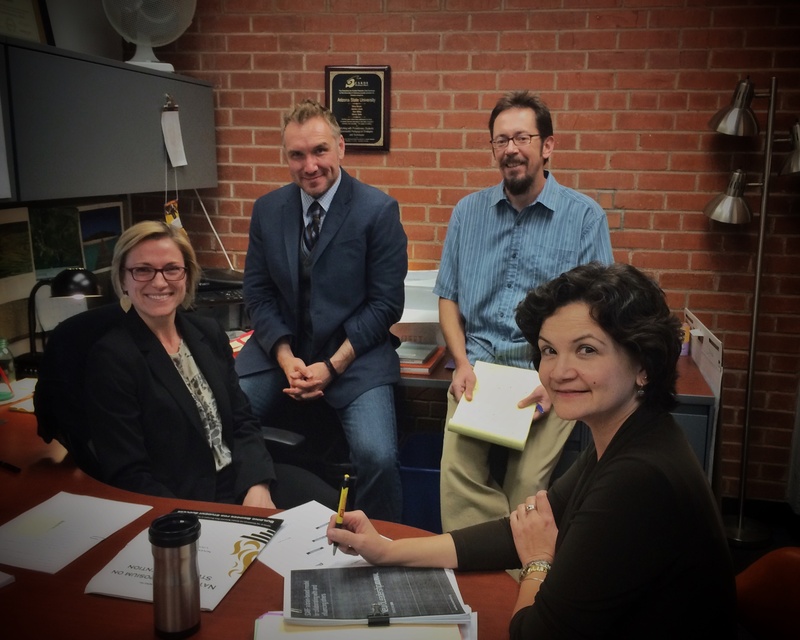 The course’s approach and positive outcomes were the focus of an award-winning paper by Beyer and fellow College of Letters and Sciences instructors James Lewis, Ken Miller and Ginny Saiki. It was one of three papers selected for recognition from the hundreds presented at the 10th annual National Symposium on Student Retention in Louisville, Kentucky, in November. More than 250 institutions were represented at the conference. “We discovered at the conference that our pedagogical approach was virtually unique among the attending institutions,” says Beyer. Immersed in a curriculum and learning environment anchored in psychological and motivational theory, undergraduates in UNI 220 do weekly self-reflective journaling, where they can explore academic, professional and personal issues in depth and get confidential feedback from instructors. The discussion-based curriculum helps students discover ways they can use their successes and strengths to overcome obstacles and setbacks, and know when to ask for help. “Time management is more of an emotional intelligence issue than a calendar management issue,” observes Beyer. Enrollments are capped at 21 students per section, which leverages the relationships and rapport formed in the group and builds a feeling of connectedness. In course evaluations, UNI 220 students often express an appreciation for how much they’ve learned about themselves and for the help in learning to be proactive about their academic responsibilities. Many express a degree of surprise about how much they enjoyed a course that they first resisted. Beyer, who has a background in psychology and behavioral therapy, says that, hands down, this is the most rewarding work she’s ever done.